Having been established in 1976, Growing Earth Tree Care hasn’t remained in business for over forty years by taking shortcuts. Formed by former Fairfax County Arborist Benjamin White, Ben had a passion for providing quality tree maintenance services to Ashburn, VA, and the surrounding regions. Our current owners worked and learned about tree pruning, tree care, and even tree and stump removal from Ben for many years before taking over the reigns in the early 90s. To this day Growing Earth Tree Care has continued this tradition of tree preservation and community service. 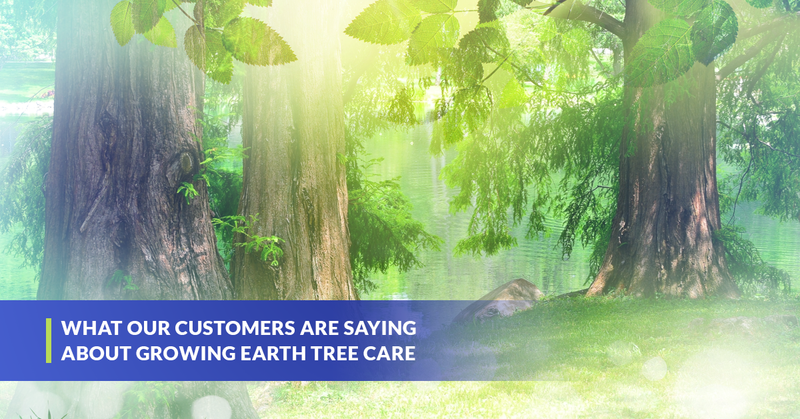 But we don’t just ask you to take our word for it; you should hear from some of our customers about what kind of excellence our tree service company consistently delivers. Thank you so much for the kind words, Daniela, they are greatly appreciated. This is the type of tree care service you can come to expect when you are working with Growing Earth Tree Care. The example that Daniela used when she mentioned that our servicemen “cleaned up every single leaf that they dropped on the lawn” is part of the standard of excellence that we hold ourselves to. Remember, we are more than just tree and stump removal guys, we are tree doctors and arborists who care about your yard as if it were our own. Now that is what we like to call a glowing review. This is why we do what we do, not only because we love taking care of mother Earth, we also enjoy making people happy about their trees and lawns. Sometimes situations get more serious than simply improving the aesthetic appeal of your homestead. Growing Earth Tree Care provides dependable emergency tree removal services so that you can get your life back to normal as soon as possible. Get in touch with us today for a free estimate to see what kind of tree maintenance is appropriate for your homestead. If you are looking for a simple tree pruning session or perhaps something more severe such as a tree disease, diagnosis, and treatment plan, we are your go-to tree service company in Ashburn and the surround areas.